Telligen employee-owners got their “walk on” for the 2018 Healthiest State Annual Walk on Wednesday, October 3. 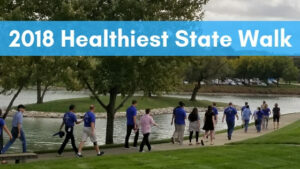 The Healthiest State Annual Walk engages hundreds of thousands of Iowans in schools, worksites and communities across the state to walk for 30 minutes. The goal of this year’s event was to have walks organized and registered in all 99 counties of Iowa. At Telligen, our employee-owners’ health and well-being is a top priority. We offer many programs and initiatives to help them lead their healthiest lives. Our Iowa employee-owners have participated in this walk every year since 2013. It’s a great way to get moving and to live out our mission of transforming lives and economies by improving health. The Annual Walk is a great way to promote wellness and encourage Iowans to take the first step in building a healthier lifestyle. We proudly support the Healthiest State Initiative and their mission to make Iowa the healthiest state in the nation.